Yesterday's FOMC statement was a non-event. The Fed basically said that everything is great, except where it isn't, but there's no reason to begin tapering QE just yet. The Fed also let us know that despite the rising costs of oil, housing, food, clothing, beard trimmers, and of course equities, that in fact inflation is incredibly low by anyone's standards -- especially the Fed's -- and in reality there is no such thing as inflation, it's all just a trick of the light; and even if inflation did exist, it certainly couldn't survive in this day and age, what with cell phones and iPads and such, so go back to sleep and we'll take care of everything. I'm sure we can trust these guys to make this all work out. It's not like they're trying to control a massive and incredibly complicated system like a national economy or something. And I mean, this is the same group of folks who assured us there was no housing bubble right before the housing bubble popped, so clearly they're better informed than we are. Meanwhile, the market still appears that it wants to continue rallying for at least a bit longer. 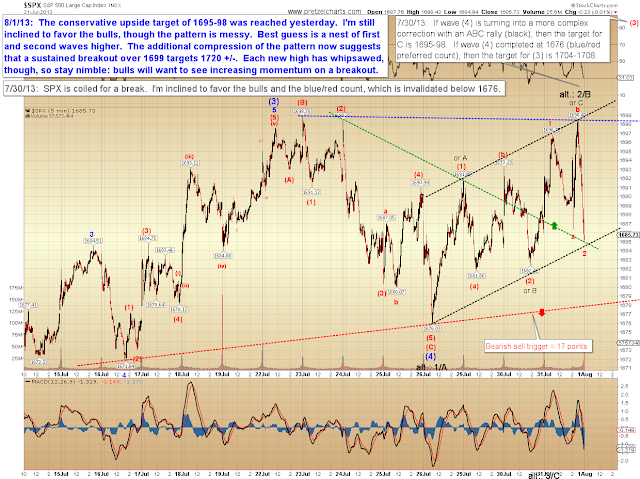 In my last update, I expected further upside for both the preferred and alternate count, and the S&P 500 (SPX) rallied into the alternate count target zone of 1695-1698. Despite the strong reversal from that zone, I'm continuing to favor my view that the bulls will push up into the preferred count's next target of 1704-1708. If the bulls can do that without whipsaw, then odds are good we're headed into the higher degree target zone of 1720-1735 (see hourly chart which follows). 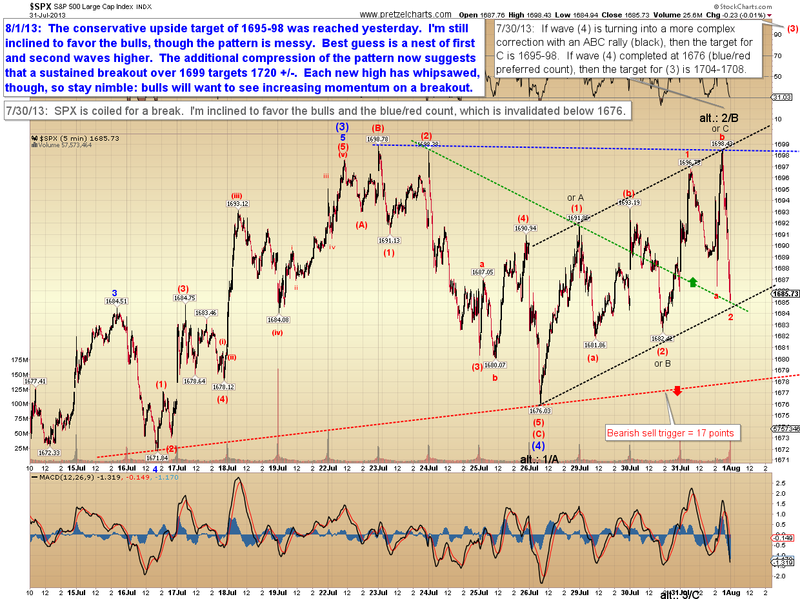 On the hourly, I continue to feel the market needs another wave up to complete this five-wave structure. 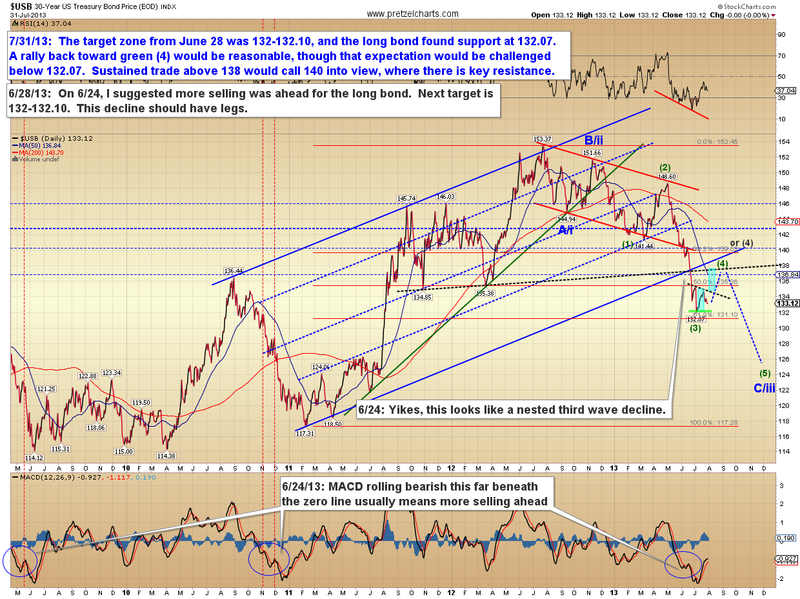 This chart has tracked well for the past few weeks. I haven't updated the long bond since the end of June, but after my last update, it subsequently found support within my very narrow target range of 132-132.10. The rally out of that zone appears impulsive, and a breakout over the dashed black line has good odds to take wave (4) up toward the 137 zone -- with a shot at 140. 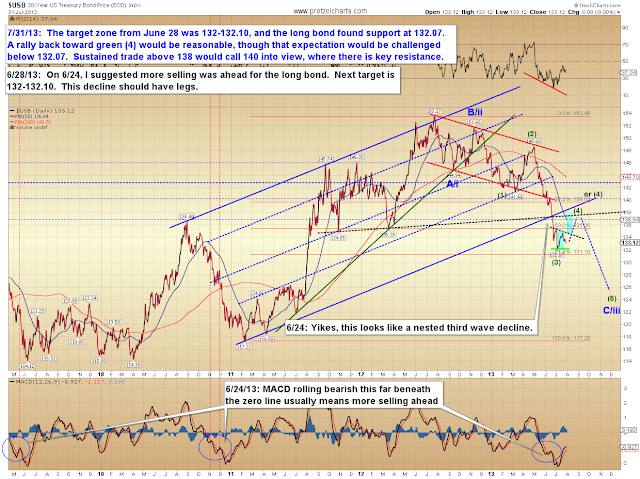 So the long bond could stabilize for a while here, but ultimately in the big picture, lower prices are expected. 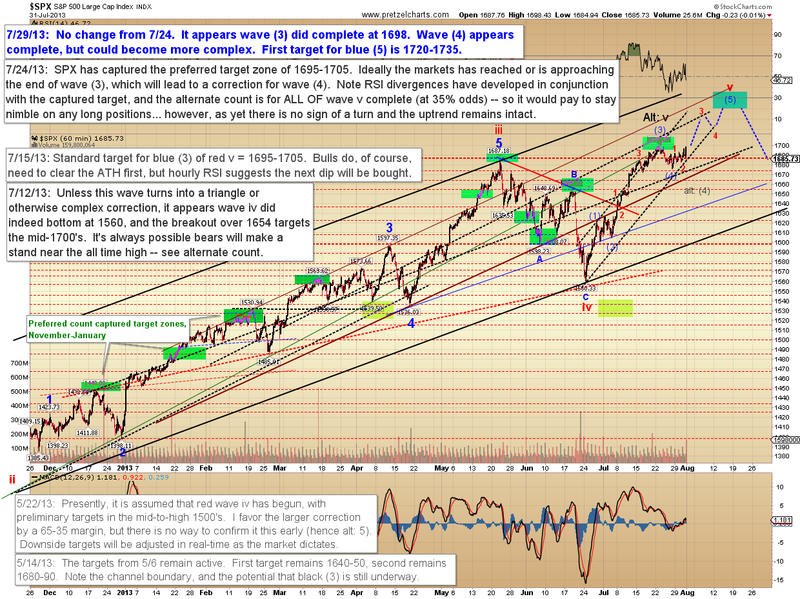 In conclusion, equities still appear to be pointed toward the next upside target zone, and I'll adjust and refine those targets as this wave unfolds in real-time. 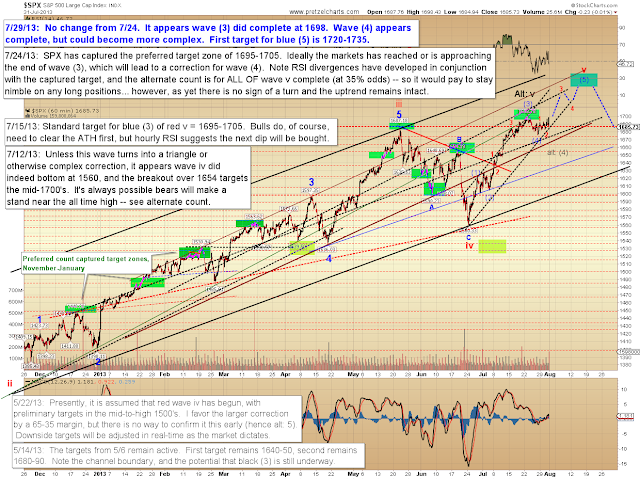 I continue to believe the market is entering the fifth wave of a fifth wave, which means a significant correction awaits upon completion. Trade safe.